Happy 100 Birthday! Denali National Park and Preserve celebrates 100 years in 2017. For a list of events and activities specific to that, please click here. Denali National Park and Preserve lies on the north flank of the Alaska Range, 250 miles south of the Arctic Circle. Originally established in 1917 as Mount McKinley National Park, the Alaska National Interest Lands Conservation Act changed the park’s status and renamed it Denali in 1980. The 1980 legislation also enlarged the park from 2 million acres to its present 6 million acres to protect Denali on all sides and to preserve the habitat of area wildlife. The park entrance is 237 highway miles north of Anchorage and 124 miles south of Fairbanks via the Parks Highway. The 92-mile Park Road provides access to national park campgrounds and to private lodges in the Kantishna area. Private vehicle traffic is restricted beyond the Savage River checkpoint at Mile 15. From late May to mid-September, the Visitor Transportation System (VTS)—comprised of shuttle buses and tour buses—provides transportation into the park beyond Mile 15. Each September, after the shuttle buses stop running for the season, the park hosts its 4-day Road Lottery event. Lottery winners can purchase a 1-day permit to drive their private vehicles the length of the Park Road (or as far as it is passable). From October through mid-February, the park road is maintained only to park headquarters at Milepost 3. Beyond Milepost 3, the road is unplowed and access to the park is by skis, snowshoes or dog sleds, depending on snow cover. In mid-February each year, the road will begin getting plowed to Mile 12.7 (on a trial basis) to encourage increased winter visitors. Visitors camping in the park or riding a shuttle bus (green bus) or tour bus (tan bus) will pay a park entrance fee of $10 per person (age 16 and older) in addition to the bus and campsite fee. Fees are subject to change. The National Parks Pass, the America the Beautiful Interagency Passes and Denali Annual Passes can be applied to the fee; information about these passes may be obtained at the visitor center. In addition to entrance and camping fees, there is a nonrefundable $6 processing fee for each campground reservation. Park shuttle bus tickets and park campsites may be reserved. Reservations may be made online. For reservations by phone, call toll-free 1-800-622-7275 (nationwide), or for international calls, phone 907-272-7275. Prepaid, reserved shuttle bus tickets may be picked up at the Wilderness Access Center shuttle desk. Any unclaimed, prepaid tickets for buses departing before 7 A.M. will be in the possession of the bus driver; however, the drivers do not sell tickets. 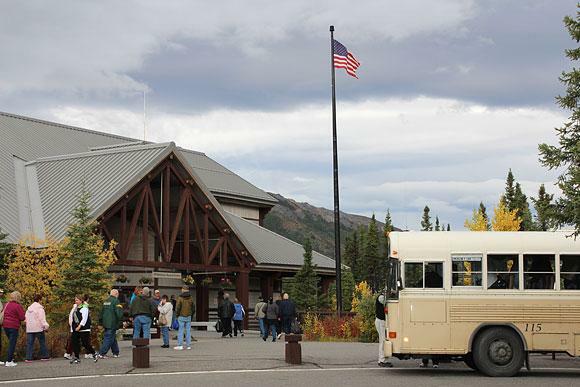 Visitor Information: The Denali Visitor Center Complex, at Mile 1.2 miles from the highway via the Park Road, and it includes the Denali Bookstore, the Morino Grill and the Visitor Center. The visitor center has staff on hand to answer questions; natural history displays; and nature films show regularly in the Karstens Theatre. The Murie Science & Learning Center, near the visitor center complex at Mile 1.3 acts as the winter visitor center from mid-September until mid-May. The Wilderness Access Center (WAC) is at Mile 0.5 Park Road. The WAC acts as the park’s transportation hub, the place where visitors can make reservations for shuttle or bus tours and campsites in the park. The Backcountry Information Center is located here. The Eielson Visitor Center, at Mile 66 on the Park Road, is a regular stop for park buses and an excellent Denali viewpoint in clear weather. The visitor centers are the source for on-site information about camping, backcountry travel, the park shuttle bus system and daily ranger-led hikes, walks and programs. The visitor centers are open from mid-May to mid-September; hours are 8 A.M. to 6 P.M. Eielson Visitor Center is open June 1 until the road closes, with daily hours from 9 A.M. to 7 P.M.
For more information, contact Denali National Park and Preserve; phone 907-683-9532. Visitor facilities within the park are limited. There is a cafeteria and bookstore at the Denali Visitor Center Complex, and the Mercantile store adjacent Riley Creek Campground, which carries grocery items, beer/wine, some camping supplies and firewood. Riley Creek is the largest and most accessible of Denali National Park’s 6 campgrounds because it is at Mile 0.3 from the highway on the Park Road. Savage River campground is at Mile 12.8 on the Park Road and—like Riley Creek—is accessible by private vehicle at any time. Tetlanika campground is at Mile 29.1 on the Park Road and a permit is required to reach this campground, which has both tent and RV sites. Sanctuary River (at Mile 22) and Wonder Lake (at Mile 84.6) are tents-only campgrounds and access is by shuttle bus. Camping fees range from $9 to $28 a night, not including $6 reservation fee ). There is a 14-day limit per year for campers. There are no RV hookups in park campgrounds. Only Riley Creek is open year-round (no running water in winter). Lodging and Services: Lodges, several massive hotel campuses, cabins, campgrounds and restaurants catering to park visitors are found along the Parks Highway between Cantwell and Healy. A cluster of businesses about a mile north of the park entrance forms Denali’s commercial district at the head of the Nenana canyon, with numerous hotels, restaurants, RV parks, a gas station with convenience store, assorted shops and commercial outfitters for river rafting, flightseeing and other park activities. The park shuttle bus service provides transportation for the majority of the park’s visitors. Some buses operate exclusively in the entrance area, shuttling visitors between the visitor center, Riley Creek Campground, the railroad depot, the sled dog demonstrations and out to the Savage River area at Mile 15. Other buses travel beyond the vehicle check station at Mile 15, providing service to Teklanika River and Wonder Lake campgrounds and Eielson Visitor Center. Check bus schedules carefully: Wonder Lake is an 11-hour bus ride round-trip. The park is open all year, although visitor access and visitor facilities are seasonal. Most campgrounds, as well as food and shuttle bus service within the park, are available only from late May to early September. Opening dates for the visitor centers, campgrounds and other park facilities and activities are announced in the spring by the Park Service and depend mainly on snow conditions in May. Closing dates for facilities and activities are announced in the fall.